If you are looking to buy a portable air conditioner, the first thing you should be aware of is that no portable AC unit would rank as excellent in terms of cooling capability. They simply do not perform as well as window air conditioners and can even have trouble getting a room to the desired temperature. However, they have some advantages like obviously being portable and you are able to store it away when not it use. One trait that you should look for that does help portable units work better is being able to dehumidify, because the more moisture that it can remove will help make a room feel cooler. All portable air conditioners must be vented through a window. There are two main design types – single-hose and dual-hose systems which both mount into a window. The single-hose systems exhaust hot air outside, while dual-hose systems pull in air from outside in one hose and exhaust warm air out the other to avoid building up negative pressure inside. Dual-hose systems tend to have a slight performance advantage, but they tend to be more expensive, more difficult to install, and are often noisier. 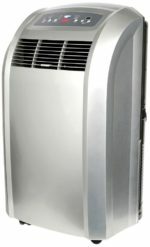 Below we review our choices for the best portable air conditioners. At the bottom of this article we have a spec comparison chart to help you compare each model. 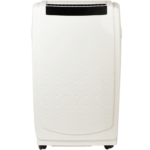 We selected the Toyotomi TAD-T40LW as the best portable air conditioner. Selling for $540 it also contains a heat pump for cool months in addition to the AC. This dual-hose model provides 14,000 BTUs and a dehumidify mode to effectively cool an area up to 500 square feet. In terms of just cooling capability we think the TAD-T40LW outperforms all others in this category. A self-evaporative condensate system removes almost all moisture, although a water tank will still need to be emptied occasionally. Other features include a timer, remote control, 4 casters, heat function, and fan-only mode. Besides the price, what other downsides are there? First it is a bit noisier than window air conditioners, but certainly not too loud. Also draining the water tank is a bit difficult since the drain plug is located about 1.5 inches off the ground. We think you should buy the Toyotomi TAD-T40LW if you simply want the best portable AC unit regardless of price or if you also need a portable heater. If price is truly a deep concern to you there are some other cheaper options. Another solid performer is the $402 Whynter ARC-12S. This air conditioner can quickly cool up to 400 square feet thanks to 12,000 BTUs and dehumidification of up to 91 pints of moisture per day. 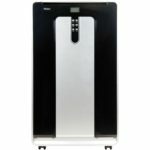 At 62 pounds it is the lightest portable air conditioner on our list and just a tick quieter than the Honeywell MN12CES. With Whynter’s patented auto-draining system condensate technology most the condensate is exhausted outside, although a small amount of moisture will collect in the condensate tank which very rarely will have to be emptied manually. It also filters the air thanks to a washable pre-filter and a carbon filter. Other features include a window installation kit with a expandable 4 foot exhaust hose, manually adjusting louver, timer, carrying handle, casters, and remote control. The actual cooling performance of the Whynter ARC-12S is just a notch below the Toyotomi TAD-T40LW, but other than that there is not much to complain about. At $569 the Friedrich ZoneAir P12B is the most expensive portable air conditioner on this list, but it did receive the highest rating from the leading consumer magazine. 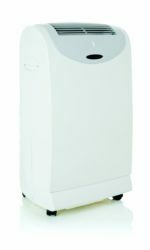 In addition to providing 11,600 BTUs, it excels at dehumidifying since it can remove up to 6 pints of moisture per hour. Along with a dual-hose design, the P12B is capable of cooling an area up to 400 square feet up to 40% faster than single-hose systems. The noise level is very similar to other units – not excessively loud, but noticeable. This Friedrich AC unit also has a self-evaporative condensate system to remove moisture. A built-in reservoir holds excess condensate that will have to be drained when full which is not often. Other features include remote control, 24 hour timer, multiple fan speeds, wheels and side handles. Unfortunately in addition to being the most expensive, the Friedrich ZoneAir P12B is also the heaviest at 86 pounds which might make it more difficult to move around. Overall it is capable of cooling a room quickly, but you will have to pay extra for that performance. The Haier HPN12XCM has some nice features and a decent price of $386. With 12,000 BTUs and the ability to remove up to 100 pints of moisture per day in extremely humid climates this single-hose unit can cool spaces up to 450 square feet. It has an automatic evaporation system to remove moisture, but the condensation tank still needs to be drained occasionally. This is one of the few AC units that lets you hook up a garden hose for continuous drainage. 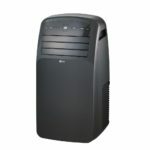 The biggest positive of the HPN12XCM is that is is the quietest portable air conditioner on this list. It also has easy-roll castors that make it super easy to move around even on carpets. Other features include 24-hour timer, remote control, washable mesh filter. The Haier HPN12XCM is just a bit below the dual-hose models it terms of overall cooling capability, but it has some advantages as well. We especially recommend the Haier HPN12XCM for a bedroom AC unit thanks to its low noise level. 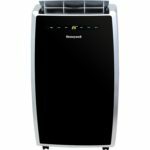 The $379 Honeywell MN12CES is the best selling model on Amazon and also the cheapest portable air conditioner on our list. With 12,000 BTUs and dehumidification of up to 70 pints per day you can cool areas up to 450 square feet. This single hose unit’s cooling capability is OK, but not great. The MN12CES is not maintenance free since you will have to drain the condensation tank periodically and it is recommended that you clean the air filter every two weeks. Simple touch controls and digital LED display make it a breeze to use. You can also use a remote control and the 24 hour timer to give you more control. It comes with a window installation kit, but many people feel the 3.3 foot flexible exhaust hose is too short. Overall the Honeywell MN12CES is relatively quiet, but it makes enough noise that you will notice it. The price makes this Honeywell unit more attractive than the actual performance, which is on par or slightly below most others on this list. The $399 LG LP1215GXR 12,000 BTU air conditioner is capable of removing up to 2.8 pints of moisture from the air per hour and can cool spaces up to 400 square feet. Performance wise it is about on par with the Honeywell MN12CES, however it is just barely the loudest model on this list. Features of the LG LP1215GXR include digital LED electronic touch controls, casters, 24-hour timer, remote control, and auto-restart after a power outage. It is lacking a full evaporation system to remove the majority of moisture through the exhaust hose so you will have to drain the condensation tank more frequently, although you can hook up a drainage hose as well. Overall the LG LP1215GXR is not a bad choice, but we feel there are better options available.